Happy 2018 to all! What are your resolutions for this year? Have you ever followed through on a resolution? Like many, my resolutions seem to go to the wayside a few months into the year. However, I’m determined to stick to my resolutions this year, to see if I can really do it. This is an awesome tutorial by Weavers of Eternity. If you’re looking for a thick bracelet, this one is for you! I like the uniform pattern that this bracelet creates. The colors I would use for this bracelet are: Peacock, Electric Blue, and Silver Gray. This tutorial is a little easier than the first, and is great for a beginner looking to brush up on their knot skills. A simple and easy bracelet to make for your friends. The colors I would use for this bracelet are: Neon Green and Neon Yellow. Dogs can be rough on their leash, so a durable one is a must. I have never made a paracord project longer than a leash so this will be a great challenge! The XOXO pattern is a fun pattern that makes the leash stand out. The colors I’d use for this leash are: Reflective Imperial Red and Reflective White. Handle wraps are a fun way to keep your flashlight or knife in great condition. I love the look of this pineapple knot by Paracord Guild, so this is a must for me to try! The colors I’d put on my handle wrap are: Black and Acid Purple. I have a lot of old rubber bracelets like the one in the video, and this is an awesome way to repurpose them! 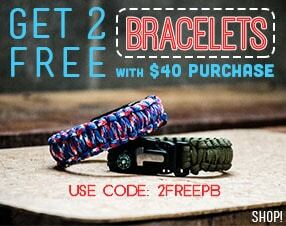 Bored Paracord has a fresh twist on the classic cobra bracelet. The colors I would use for this bracelet are: Lovespell and Rose Pink. Have you subscribed to our Youtube channel yet? We post tutorials and product spotlights frequently and are always open to suggestions! Click the picture below to subscribe, and happy cording! 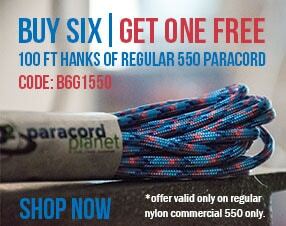 What are your paracord New Years resolutions? Are there tutorials you want to try? Share with us on Facebook, Twitter, Instagram, Pinterest, Youtube, and Google+! Here's to another great year of paracording!